Make sure to follow these rules when giving rides in New Jersey, and to keep an eye on your email for important news and updates from Lyft. If you're applying to become a driver in New Jersey, check out the application steps. 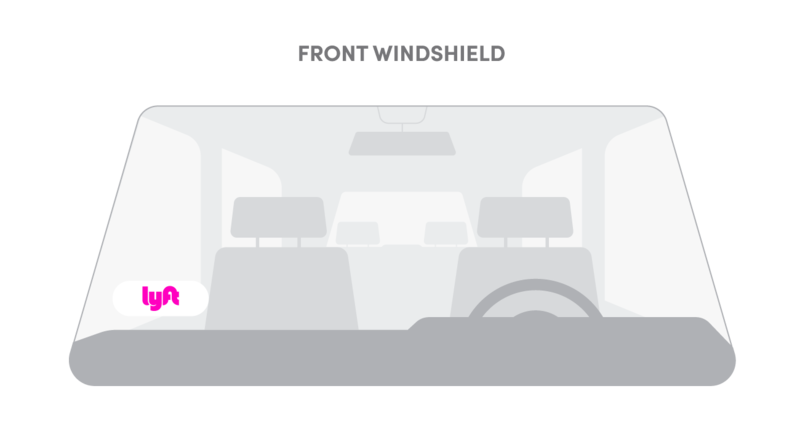 Drivers are required to display the Lyft emblem in the lower right side of their front windshield while in driver mode (refer to the image above). If you've just been approved to drive, you should receive your emblem shortly. If you never received it, or need a new one, send us a message with your shipping address. In the meantime, you can print out a temporary emblem — make sure to print in color. If you are a New Jersey driver, you agree to notify Lyft if you are convicted, charged or arrested for a violent crime, felony, sexual offense, driving offense, or drug-related offense. New Jersey drivers are required to maintain a current driver's license and vehicle registration. Always update your documents via the Dashboard when they expire. If you're already a driver in a different state, and you're moving to New Jersey, send us a message with the following info. Please note, you will be required to have your vehicle registered in New Jersey, Pennsylvania, or New York. Please note: if you are a driver in New Jersey, you are not able to receive ride requests in New York City. If a passenger ride has brought you into New York City, you will need to return to New Jersey in order to receive another ride. If you would like to switch to New York City, or you're moving from New Jersey to a different state, find your new market in the list here to see what steps you'll need to take.